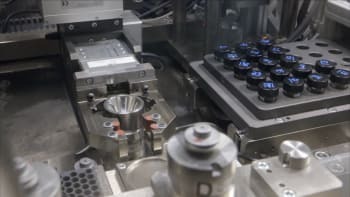 Engineers at Oak Ridge National Laboratory (ORNL) have developed a new technique to streamline the production of plutonium-238 (Pu-238), a fuel that’s critical for long term space exploration missions. Pu-238, a radioactive isotope of plutonium, has been used as a fuel source by NASA since the launch of Pioneer 10 on March 2, 1972. In the years since, Pu-238 has been employed as a fuel source for numerous missions including Voyager 1 and 2, Cassini-Huygens, Curiosity, and New Horizons, to name a few. To generate power via Pu-238, spacecraft carry aboard a radioisotope thermoelectric generator that converts the heat being released from Pu-238’s radioactive decay into electricity. That electricity can be stored in the craft’s batteries or used to power any instruments on board. The only problem with the use of Pu-238 on off world ventures is that it’s not the planet’s most abundant material, and sophisticated and time-consuming processes must be used to refine the material into a useful form. While the difficulty in producing quantities of Pu-238 hasn’t been overcome, ORNL engineers have recently developed an automated process for refining the precursor of the isotope, making it possible to increase the total output of Pu-238. Given this development in processing, NASA engineers can confidently continue their work developing deep space missions to explore the moons and planets of our solar system without delay. If ORNL researchers can continue to refine their production processes, they’ll have made admirable strides to limiting the material constraints of this mortal coil.